Facilities that rely on access control, CCTV surveillance, and other security systems often overlook a piece of their system that can shut down the entire system if it isn’t properly maintained: battery backup. Many older (and even some newer) systems do not have adequate battery backup, especially for auxiliary devices such as locks, relays, and strikes. In many cases, even in situations where there is a battery backup, these devices are not properly supervised or maintained of which can result in doors that are unable to be locked or unlocked in the event of a power outage. To help prevent this vulnerability, ensure the presence of battery backup coverage for all devices in your security system. Another way to protect your security system from outages is to upgrade or move to a smart power system, especially for any new construction. A smart power system gives its users intelligible monitoring and maintenance of the power being driven to your security system. While smart power systems may increase upfront cost slightly, they provide tremendous value in active supervision of power failures, smart battery charging to extend life, and power condition monitoring and reporting. Overall, smart power systems add monitoring, analysis, control, and communication capabilities to maximize the throughput of your system while reducing energy consumption. Another key value of a smart power system is the ability to remotely and safely recycle power. 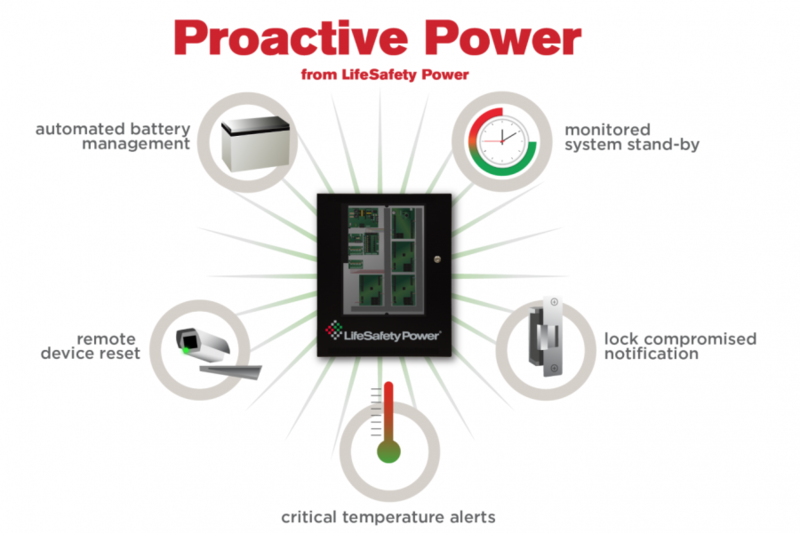 Our smart power system provider of choice, LifeSafety Power, lets end-users monitor power consumption for security systems proactively, spotting and reporting outages and other problems before they occur. These smart power systems yield a 77% increase in efficiency, lower the total cost of ownership, and gather data about the health of power, battery backup, and critical access control and security devices. Their latest technology also allows for remote maintenance of the system, eliminating the need for costly and time-consuming on-site servicing. Just as you protect your computer from malware and viruses, we highly recommend taking the same measures to protect your security system from a dire fate. Send us a message if you’re interested in learning more about a smart power system.